Glamour is made from a white material covered in purple and pink spots. She has sparkly, purple and black button eyes and a sparkly pink button nose. Her muzzle and belly are pink and she has sparkly pink material for the inside of her ears. The prettiest one I surely think! 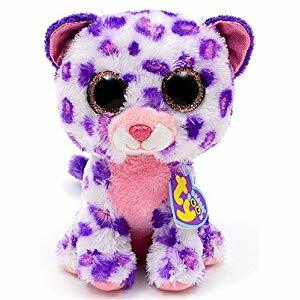 Glamour the Leopard was introduced in June 2012 as a Justice Stores exclusive. There is also a retail version of Glamour which varies slightly in colour from the Justice Stores version.